Our friends at Painted Lady Vineyard and The Xerces Society have provided these detailed instructions to cold soak and stratify your milkweed seeds to get better and faster germination! Slow soaking and rinsing milkweed seeds removes a naturally occurring chemical from the seed surface to enable quick germination. In nature, this chemical prevents premature sprouting during extreme conditions such as prolonged drought or extreme cold.The stratification process mimics environmental conditions for the seeds that would naturally germinate at the end of a long wet winter. A sterile, clean environment is required to prevent mold from growing in the stratification process. Mold destroys the seeds. Handle seeds and vermiculite in sterile conditions. Rubber, non-latex, gloves should be used. Use sterile water, containers, and tools. Note: It is best to read through the entire process once or twice to familiarize yourself with the process, then assemble the tools needed before starting. 1. Pre-chill one gallon of distilled water. If more than one species of seed is being germinated keep species separate—label the jars, one for each species. 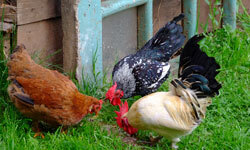 Mix each species with one cup of pre-chilled distilled water. Soak for 24 hours in the refrigerator. By keeping species separate throughout process, site specific planting will be an option and plant identification is made easy. 2. After 24 hours, pour seeds into a clean strainer. Wearing sterile gloves, rinse with distilled water. Drain excess water. 3. Add one cup vermiculite into the sterile containers with lids. Slowly add approximately 1/3 cup distilled water to each container of vermiculite until just moist but not dripping. Mix rinsed seeds into vermiculite using your gloved hands. Seal container and label accordingly. Store in refrigerator for 30 days. 4. 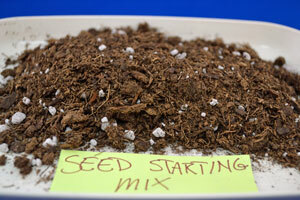 Plant entire mixture of seeds and vermiculite or sift seeds out. Plant at 1/4” depth in prepared seed bed when soil temps are warm (70°F+). These temperatures usually occur when the daytime air temperature reaches around 80 degrees. When nighttime temperatures are 65 – 70 °F your soil temps should be very close to the same temperature. Water the newly planted seeds often until germination becomes evident. Keep up with your watering until plants are established. 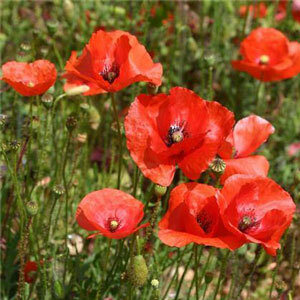 For germination, water lightly and frequently to prevent top of soil from drying out. 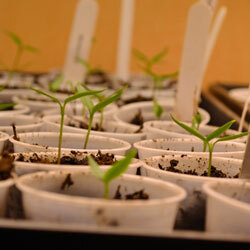 When seedlings are about 1 inch tall, reduce the frequency of watering to 2 or 3 times weekly. Increase the amount of water per application to achieve greater soaking depths for development of healthy tap roots. Alternate soil moisture from good deep soakings to moderately dry in between watering. Roots need a balance of oxygen. Reduce frequency of watering over time as plants become established. Supplemental water may be discontinued as seasonal rains return. Encourage and enjoy! By doing this you are playing an important role in life on earth. 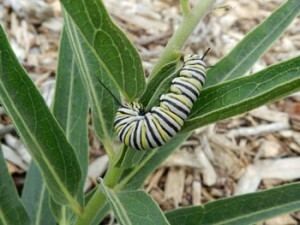 And watch your milkweed patch for monarchs, their eggs, the caterpillars and then …. the butterfly again! NOTE: Please do NOT use pesticides on milkweeds. Monarch caterpillars must munch on milkweed leaves in their natural lifecycle. Established perennial milkweeds grow back year after year from same roots. Thanks to Native American Seed for these instructions which have been modified only slightly to suit the seeds grown here. 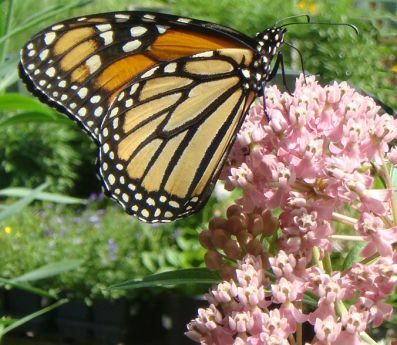 Many thanks to the Xerces Society for Invertebrate Conservation for their support of this milkweed seed production program, and to Painted Lady Vineyard for growing the Spider Milkweed for seed. What type of container is best to use for seed refrigeration? Would a quart size Ball canning jar work? Any container that will hold the seed and can be refrigerated will work, so a quart canning jar will do wonderfully! No wonder seeds never grew for me! I had given up. Thanks for info! Claire, we’ve had customers tell us that they have used a simplified version of the procedure with just soaking the seeds in wet sand in the fridge for a month, then planting them and they had almost 100% germination. You might give this a try as well! I planted one milkweed last year and just finished collecting the opened pods for this summer. What’s the best way to store them? I live in Milwaukee area. When should I start soaking the seeds for indoor germination? Glad to hear of your participation in spreading milkweed, Patti! After you clean the floss off, store them in a cool and dry location until spring. 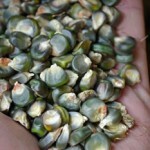 The refrigerator is an excellent place as it will give them the cold stratification they need for better germination. 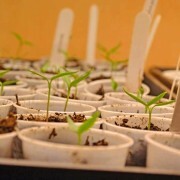 The cold soak procedure takes about one to two months, so start them so that they will be ready to plant after the soil is warm. 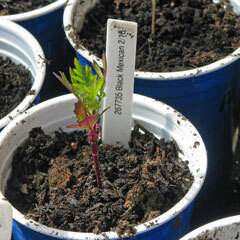 Then when you sow them inside and they are ready for transplant, the soil is warm and they can take off growing. Check out the First and Last Frost Dates tool using your zip-code to find when to start the process. I am planting Showy Milkweed with my class. I am probably going to start planting the milkweed soon. I haven’t vernalized the milkweed seeds yet, when I should move before hand. Is there a possible way to vernalize the milkweed seeds within 1-2 weeks? 1-2 weeks is probably when we’ll start. Thanks. Sage, yes there is. Soak the milkweed seeds in damp to almost wet sand in the refrigerator for 1 – 2 weeks, changing out the water once a week. Then plant the seeds as usual. This tip was passed on to us by local Monarch Watch participants who experimented with faster, simpler vernalization techniques and found this to be very successful!